The 16 girls from the Inter Madrassah Organisation (IMO) were inspired to take action after attending a workshop led by Together Lancashire and Food Power. As part of the walk, they presented Blackburn with Darwen Borough Council’s Executive Member for Children and Young People with a letter and poem asking for her support. I feel it’s important to empower our youngsters and work with them to help make a real difference to their communities. I’m proud to see the Power to the Youth Team take on this walk to help highlight the issue of child food poverty and be pro-active in campaigning for a better future for children in our borough. I will make sure that I play my part by highlighting this initiative with my fellow members on the council to ensure that we are doing everything we possibly can to address this issue. I’d like to say a big well done to everyone who took part in the walk. The youngsters were working with the IMO on the National Citizenship Service (NCS). The Power to the Youth Team were so concerned after attending the workshop delivered by Gill Beeley from Together Lancashire and Ben Pearson from Food Power and they wanted to make more people aware of the issue and to encourage more people to donate food to the food banks in Blackburn with Darwen. The group collectively decided to do the five mile walk along with volunteers. 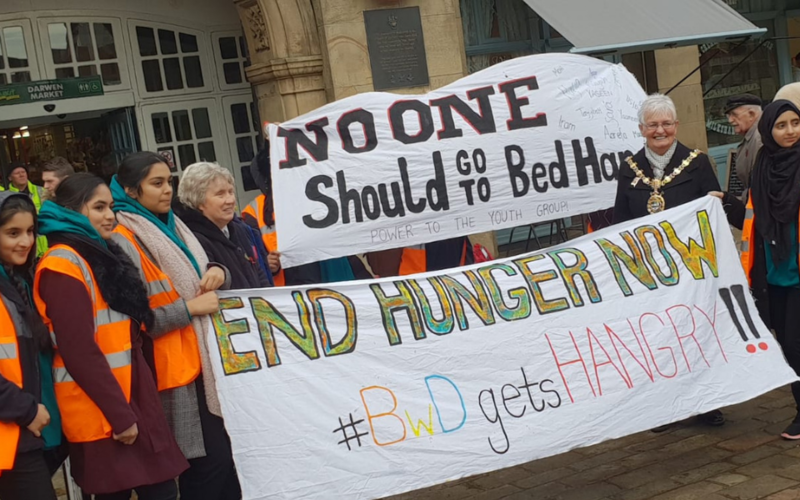 The route took them from Darwen town centre to Blackburn Town Hall and they started by holding banners and posters to raise awareness of child food poverty. There was a positive response from the public during the entirety of the walk – people stopped and read the banners, beeped their car horns and others waved to show their support and appreciation. The girls met with Mayor of Blackburn with Darwen, Cllr Pat McFall and Cllr Jackie Floyd, Blackburn with Darwen Borough Council’s Assistant Executive Member for Health and Adult Social Care to highlight their plight. I think it’s fantastic that this group from the Power to the Youth Team has embarked on a walk to raise awareness of child food poverty. Blackburn with Darwen Borough Council takes issues like these extremely seriously. We recently committed to drafting a new Food Strategy and that is something I will be heavily involved with developing. I would like to continue to work with the Power to the Youth Team and see what ideas they can suggest to help our borough going forward. Sponsorship raised by the group has been passed to the Al-Imdaad Foundation UK, which supports the child food poverty cause. A proportion will be donated to the Darwen Food Larder, based at Cornfield Cliffe, the Blackburn Food Bank, on Oakenhurst Road, and the Al Imdaad Food Bank. There are collection points for the foodbanks at shops across the borough or you can drop donations at their bases.